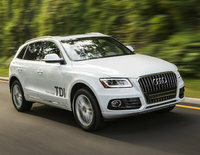 CarGurus has 1,471 nationwide Touareg listings starting at $2,488. 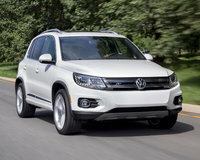 Though ballyhooed as a car for everyman, Volkswagen’s 2014 Touareg midsize crossover certainly isn’t priced like that. However, this 5-passenger people hauler does pack a lot of high-end appearance goodies and creature comforts onto its handsome frame, totes a respectable 64 cubic feet of cargo room (with the rear seatbacks folded) and comes with a choice of 3 capable powerplants: a gasoline-burning V6, a turbodiesel V6 or a supercharged V6 hybrid engine. Meantime, all the various iterations of the 2014 Touareg continue to be delivered with standard full-time all-wheel drive (AWD). With the addition of the R-Line trim for 2014, this classy crossover now boasts 5 variations of capable conveyance, the base Sport, the loaded-up Lux, the sporty R-Line, the flagship Executive and the somewhat pointless Hybrid. Excluding the Hybrid, 4 of the 5 trims can be delivered, furthermore, in either a VR6 (gasoline-fired) trim or a TDI (turbodiesel) edition. For this year, in addition to the new R-Line trim level, VW’s turbodiesel-equipped TDI boasts some added ponies, while a few marginal updates have been given to various standard and optional features. Powering the Touareg V6 lineup again for 2014 is a 3.6-liter V6 engine that remains under the management of an 8-speed shiftable automatic transmission. Look for 280 hp and 266 lb-ft of torque from this combo, with towing maxed out at a fairly hefty 7,716 pounds with the available trailer hitch and wiring installed. This variable-valve-timed (VVT) six-banger’s mileage, meanwhile, is estimated at 17 mpg city/23 highway. The TDI (Turbocharged Direct Injection) editions again pack a 3.0-liter V6 turbodiesel powerplant that combines with the 8-speed shiftable automatic for 240 hp (jacked up from last year’s 225 hp) and 406 lb-ft of torque. Towing is, curiously, maxed out at a less-than-impressive 7,000 pounds with the proper equipment, but mileage in one of these tricked-out turbodiesel-toting VWs is estimated at a sweet 20/29. The Hybrid, finally, comes with a supercharged 3.0-liter V6 gasoline engine that combines with the single 288-volt electric motor and the 8-speed shiftable automatic to deliver a total of 380 hp and 428 lb-ft of torque. Towing figures are unavailable, but ought to be heftier than much of its hybrid competition. Mileage, despite VVT, remains 20/24, notably less impressive than the TDI variants. The various Touareg trims, even the base VR6 Sport, again boast an impressive array of standard bells and whistles. Said V6 Sport carrys, for example, 18-inch alloy wheels, a rear spoiler, a roof rack, heated power-adjustable mirrors and a power liftgate outside, with heated, power-adjustable leatherette front seats, alloy and leather accents, reclining and split-folding rear seats, and full power accessories adorning the interior. Cruise control, telescoping tilt-wheel steering, an auto-dimming rear-view mirror and a remote garage door opener keep convenience at one's fingertips, while dual-zone climate control helps keep everyone comfy. Entertainment, meanwhile, is offered via a 6-CD changer boasting 8 speakers, and is bolstered by satellite radio, a memory-card slot and a USB port. Communications, of course, remain overseen by standard Bluetooth hands-free technology. The TDI Sport again remains available only as the TDI Sport w/Navigation trim, and adds a hard-drive-based navigation suite with touchscreen display, an integrated rear-view camera and a DVD-interfaced video system to the traditional Sport trim mix. Stepping up to the pair of Lux trims, look for 19-inch alloy wheels and a power flip-up liftgate window on the exterior, with leather upholstery, upgraded cabin accents, driver's memory settings and real-time traffic added inside. The sporty new R-Line pairing, meanwhile, throws a sport-tuned suspension and 20-inch alloy wheels into the equation, while deleting the Lux’s cabin accent upgrades and the power-opening rear liftgate window. The top-shelf Touareg Executive twain flaunt all the various amenities of their Lux stable mates, along with a heated steering wheel and a Dynaudio sound system with 620 watts of power and 10 premium speakers. This top-shelf trim level also boasts unique badges and graphics, as well as upgraded exterior trim accents. The Hybrid, finally, adds an eco-efficiency display to the total, as well as front and rear parking sensors, a simulated aerial camera display, a driver-memory-interfaced power-adjustable telescoping and tilting steering wheel, heated rear seats and push-button start with remote keyless entry. With all that bling, it’s no wonder that this semi-ute’s optional equipment remains more in the realm of accessorizing rather than improving. In any case, splash guards, upgraded floor and cargo mats, and the above-mentioned trailer hitch and wiring remain available to the Toureg lineup. Noteworthy standard safety equipment for all 2014 Touareg trim levels once more consists of 4-wheel antilock brakes (ABS), traction and stability control, front and rear head airbags, front side-mounted airbags and front head restraint whiplash protection. Also standard aboard all trims are LED daytime running lights, front fog/driving lights, turn-signal-integrated mirrors, high-intensity-discharge (HID) headlights, a post-collision safety system and a remote antitheft alarm. 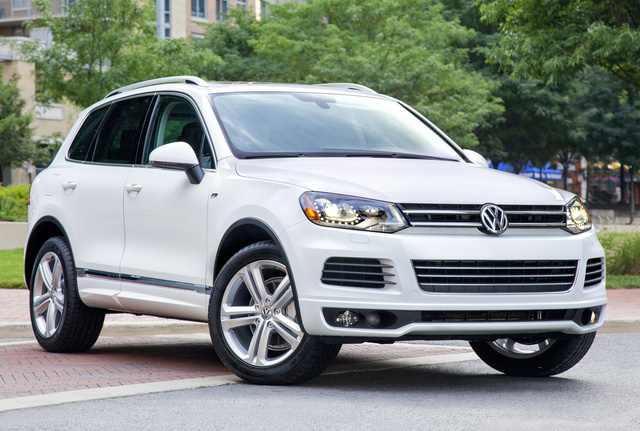 What's your take on the 2014 Volkswagen Touareg? fleetandre It is amazing how highly detailed and fitting a Volkswagen Touareg is to a person out in search for an SUV. Their technology is state-of-the-art and there is no denying that the insides of this car feel like a high-end luxurious vehicle. jhalfman bought in Aug 2015 and love it towed a crew cab dually project home 350 miles and it didn't miss a beat total weight of 7100 lbs and it acted like was a 3500lb load with the v6 executive the 370 gears are a great combo it would hold 70 75 up hill without breathing heavy VW has outdone themselves when this one is used up we will trade for another new one. 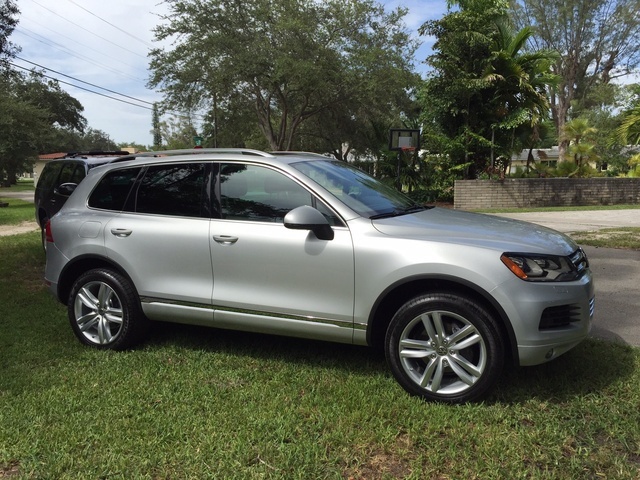 Have you driven a 2014 Volkswagen Touareg?